I can still remember the beginning of my final year at Junior school (and I was born in 1949), when one of our teachers arrived one day in this strange little car – a brand new tartan red Morris Mini Minor. It really was so different from anything we had seen before, with its tiny wheels and rather gaudy interior. 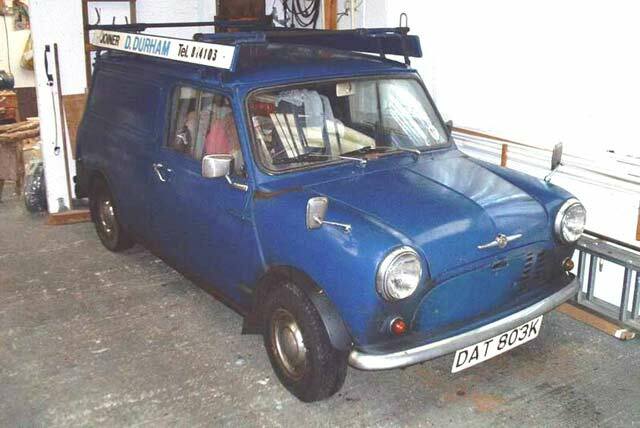 Although I later got to help with work on a few Minis and vans, it was not until 1967 that I actually owned one. This was a 1960 van, hand painted in a Ford light blue, which had been to the Moon and back and had all of the usual faults and failings of a seven-year-old vehicle and probably a few more besides! I was in the middle of my apprenticeship as an Aeronautical engineer and could not really afford anything much better, but David Durham, a life long Pal of mine had a friend who was getting rid of another slightly newer van in commercial beige. Around this time I was avidly reading Car and Car Conversions and learning of the exploits of Clive Trickey (now sadly no longer with us) who had bought a written off mini van and a brand new saloon body shell, to build a car for the Mini Seven formula races in which he became very successful, I think from memory it was registered KTR 223E. This really spurred me on to build something for myself for road use, as by now I was getting fed up with inheriting other people’s rust! I decided to buy the beige van, (known affectionately as FUB – from its registration number) to use, keeping the blue one as a donor for a new shell. At that time a new BL shell was around £80 (yes eighty) and a rear sub frame was under a tenner. This was still going to be a struggle financially, but fate stepped in one day as I was filling up with fuel at our local garage. A breakdown truck was just off-loading a very lightly rolled, almost new mini. I quickly paid for my fuel and dashed round to the workshops to find the foreman, who said it was probably going to be a write-off. A couple of days later I went in again and he said that the insurance assessor had decided it would be re-shelled and if I wanted I could buy the old (virtually new) shell for £4 as scrap but would have to take it away myself! A relative of mine had a Taxi with a big trailer and he ‘volunteered’ to bring it home for me. Work now started in earnest on the new project and the roof was straightened up so that the screens and doors fitted properly, then filled in a few small areas and covered in black vinyl which was not so out of place in those days. I decided to chop the almost undamaged front off (sacrilege!) and fit a hinged fibreglass Clubman front, which I collected from Bill Needham at Coldwell Engineering in Sheffield in FUB, the old faithful van - that was a real struggle as it only just fitted, my girlfriend at the time having to travel all of the way back to Hull with her head bowed forward, as the corner of the front was hanging over her seat back. 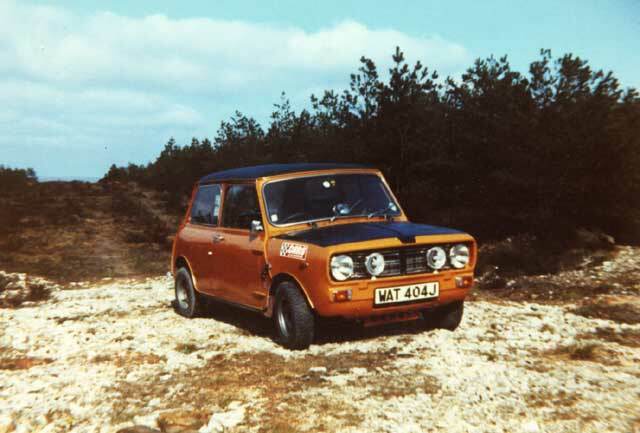 The Clubman models were very new then and I think that Bill was one of the first to make a pattern of it. The moulding was absolutely superb and never looked like glass fibre. I learned an awful lot about panel gaps and fit doing that car and it never gave any real trouble in the 11 years that I tortured it. In those days in Hull we had a BL agent, Kennings and during the week they were open until very late into the evening (frequently after 9pm) and it was a bit like a club whenever I went for bits, they even had a coffee machine. Those Parts guys certainly knew their stuff, you could ask for a part and they would write the part number on the bill without even thinking about it and then go and collect it, returning with comments like ‘Well this one’s off a Land Rover, but its identical and cheaper’. They were so helpful, even with awkward little clips and brackets and the like. So, gradually all of the useable parts of the donor van were refurbished ready to be fitted to the shell when it was ready. Quite a few parts were also sourced from the various breakers around the area, often necessitating climbing two or three cars high in search of that elusive part. Things have changed rather a lot since then! I was quite friendly with the Head of the Precision Engineering workshop at the Factory, Wilf Batty who himself was a keen ‘fettler’ and he agreed to paint the shell for me in BL Bronze Yellow cellulose, in our own garage over a weekend. He explained every step of what he was doing and why and on the Saturday evening, left the car in primer for me to flat the following morning, before returning to colour it. He was an absolute perfectionist and did a job, which was the envy of many of my friends for a number of years. Shortly after this, aforesaid lifelong Pal got an old mini van himself, to use for his newly fledged joinery business. 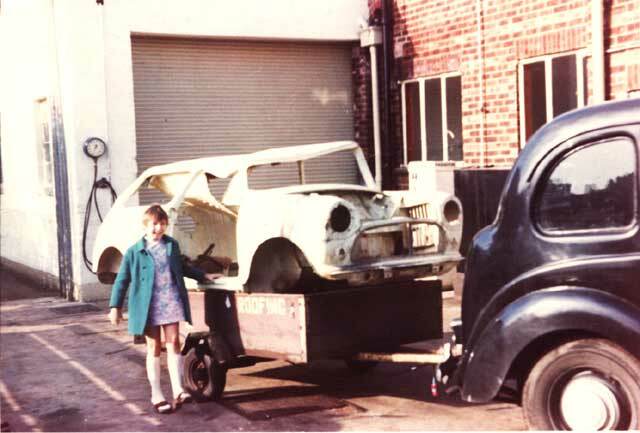 This was also rusty and he too liked the idea of a new shell to bypass that problem, so in 1972 he bought a new van shell (£178 by now) and we set to, transferring all of the parts into it, but only after he had rust proofed and hand painted it on a kind of home made wooden ‘spit roaster’. This is still his ‘Firms vehicle’ with close on 300,000 miles to its credit on 3 engines built by me. It has certainly earned its keep, frequently pulling a heavy trailer and is still on its original wings, sills and floors! The 'Firms Vehicle' - the 'Grot' around the seams, indicators and headlamps is not rust, it's grease - the MOT man loves him! 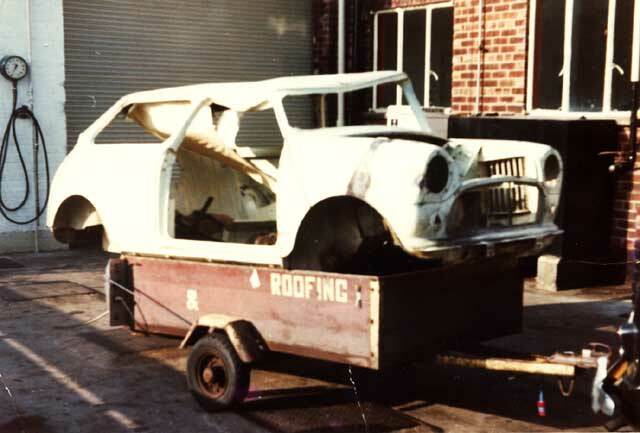 I decided in 1975 that it was time for change of image for the Mini, so it was stripped to a shell again and re-sprayed in Vauxhall Sapphire starmist, this time by my own fair hand. 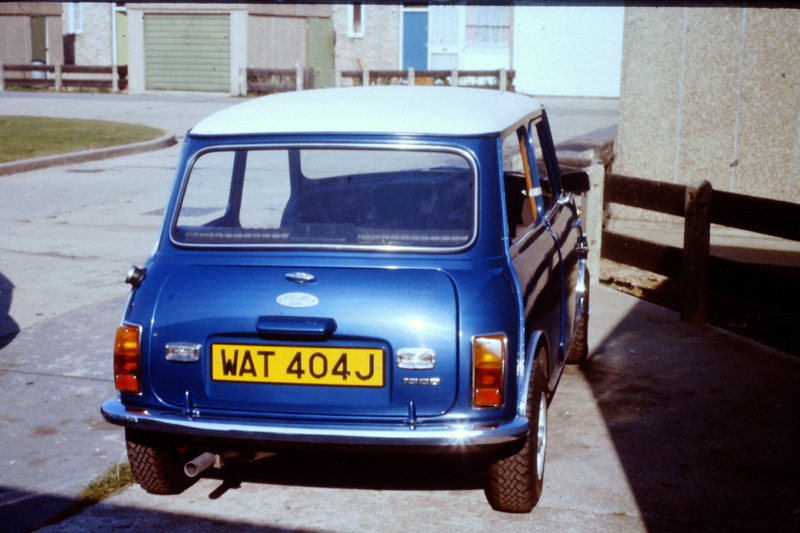 I did the roof in cream vinyl and painted the Dunlop wheels in a similar colour, it really looked the mutt’s nuts. By this time the engine had also grown to 1275cc, complete with a pot jointed box. 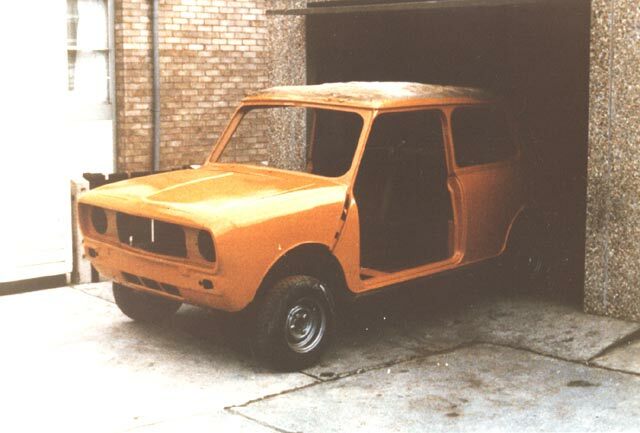 These pics were taken during build up, sometime mid 1975 No glass in the sides and the passenger door yet to be fitted. Still a great colour. 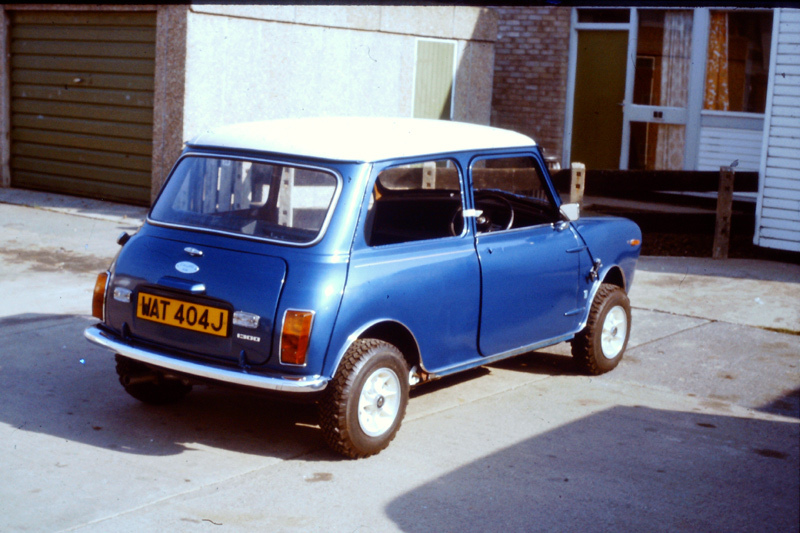 I retired this first hand built Mini in about 1980 but still kept it and always seemed to have another Mini hanging around somewhere and I re-shelled quite a few write-offs in the next few years, including a pickup and an estate. At around this time I also started collecting all the best bits I could find to build a really smart Clubman estate from a virtually new shell with the tiniest bit of damage I have ever seen on one requiring replacement. I kind of drifted into other vehicles during the eighties and early nineties (including motorbikes) and built a Jaguar XJS Cabriolet from a damaged donor car and a brand new shell, but I still kept the Estate and continued the search for the right bits. It’s been on its wheels (those Dunlop alloys) with all the running gear fitted, in a dry wooden shed for close on twenty years now and has occasionally been much closer to being finished than it is today, as I keep nicking bits off it when another project intervenes or the need arises! It really only needs painting, trimming and final assembly. A real turning point was reached in mid 2000 when a friend in Hull, who runs a vehicle dismantlers, rang me to say that he had just picked up a damaged 1999 twin-point injection Cooper with sports suspension and red leather seats, just ripe for re-shelling! I went over to look at it and videoed all of the important details and went home to check on the prices of parts to see if it was worth doing. It was looking rather unlikely that I would take it on, as the figures were not making economic sense, when he rang me back to say that the Insurers had now re-categorised it as a dismantler. Needless to say, I have bought every single piece of it (except for the front half of the shell, bearing its all important chassis number, which has to be crushed and its identity surrendered). I will probably make a ‘Cooper trailer’ from the rear section of the shell but I hope that doesn’t take another twenty years! This now means that I can have a Clubman estate with the latest Cooper unit (and indeed, the very last variant of the beloved ‘A’ series engine) together with those lovely white faced instruments, alloy dash, leather seats, sports suspension, wheels and the like. Had I been able to re-shell the Cooper, I would have had to paint a new shell anyway, so I may as well complete the Estate at last! Hope to see you around at some of the shows and keep those Minis alive, there is always a way!